At the forefront of antenna design and manufacture since 1973, the Company excels in the research, design and manufacture of ultra-wideband microwave antennas, subsystems and associated microwave components. It provides a flexible and responsive service utilising in-house microwave engineering expertise to successfully satisfy challenging commercial and defence antenna projects. 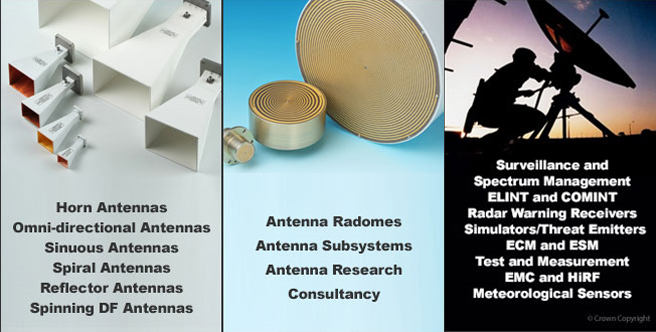 With more than 40 years of microwave engineering, design and manufacturing expertise of single, dual linear and circular receive and transmit antennas, Steatite has a proven capability to provide a wide range of high quality COTS ultra wideband antenna products operating within the range 0.01 and 500 GHz not matched elsewhere. Bespoke designs or modifications are regularly accommodated and form part of the Company’s extensive offering. CONSULTANCY Steatite regularly undertakes antenna related research, design and manufacture for military and civil clients including development studies, prototyping and technical concept studies. Technical consultancy and in-service support form part of its regular portfolio of activities. The Company has many years’ experience of providing innovative customised, ultra wideband antennas and subsystems to the global defence, surveillance and sensor markets.